Paradise spoiled – plastic on the beach. 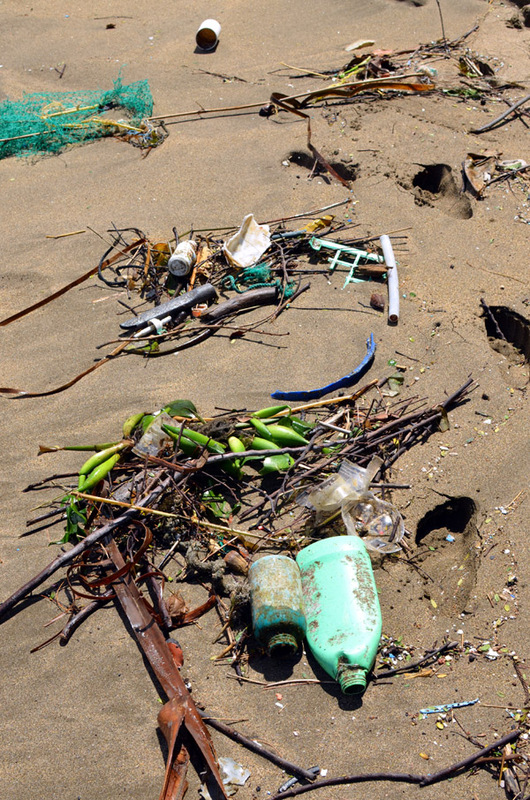 Nine years ago, while visiting the Hawaiian island of Kauai, my wife, Western University Earth Sciences Professor Patricia Corcoran, and I noticed an abundance of plastic debris on some of the beaches we visited. 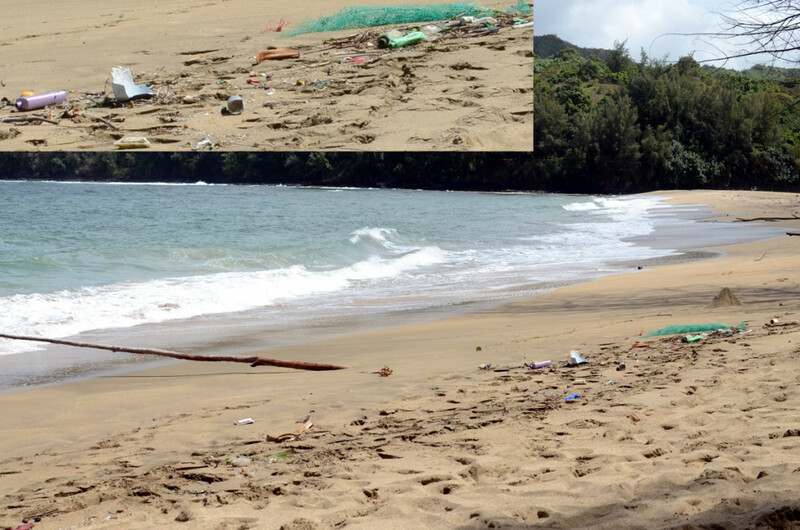 In particular, the beaches on the east side of the island contained plastic debris ranging in size from massive tangles of fishing nets, ropes, buoys and lines to micro sized degraded bits and industrial pellets. After a subsequent trip and scientific sampling of the beaches on the island we published our first paper on the subject(1). Over the years, Patricia and her students have studied the growing issue of plastics pollution at various locales, including the Great Lakes and their tributaries – the same waters many of us call our home fishing waters. The source of this plastic is no great mystery. The buoyant properties of most plastics means that any plastic not properly disposed of will most likely follow the course of water. Look at the grate on any storm sewer outflow and you’ll see what I mean. It’ll be clogged with plastic bags, bottles and other debris. Every last piece of it came from someone who could have placed it in a recycling bin or trash can. It gets swept along from city streets to sewers, streams, rivers and finally to lakes and oceans. There it degrades in the sun, breaking into smaller pieces to be deposited along our shores, on lake and ocean bottoms, or worse, ingested by birds, turtles and fish. 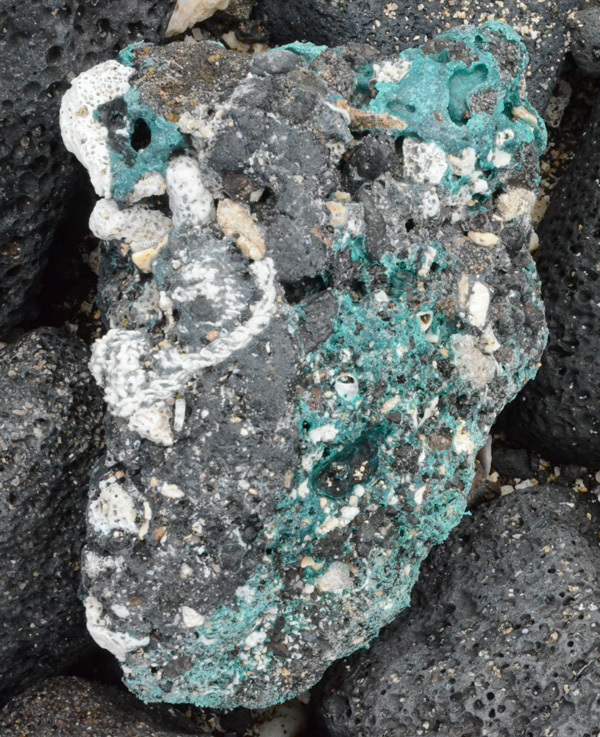 Plastiglomerate – rock and plastic, a new anthropogenic marker? Plastic rocks: Large pieces of plastic debris are generally removed from tourist beaches. Other, more remote shores see a build-up of debris that is burned unintentionally by people building campfires, or intentionally by people believing that burning is a safe way to make plastics “disappear”. The plastic melts and mixes with rock fragments, mineral grains, shells, and organic debris to form plastiglomerate(2), a human-made stone that may one day serve as a geologic marker of the age of man (the informal “Anthropocene”). 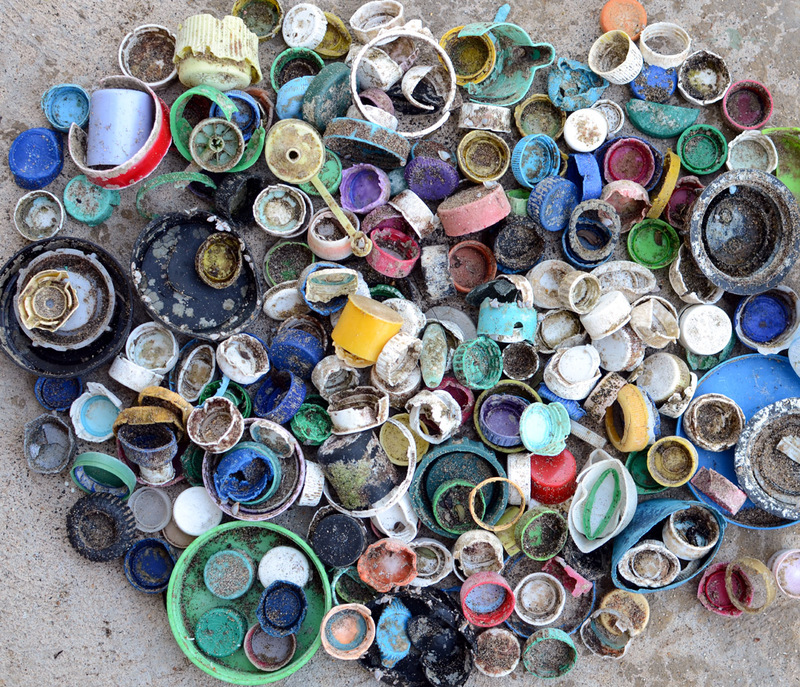 A collection of plastic bottle caps and lids from the high water line of Wainiha Beach, Kauai, Hawaii. Lids, lids, everywhere you look: There are so many plastic bottle caps and lids in our waters now that it is close to unthinkable. 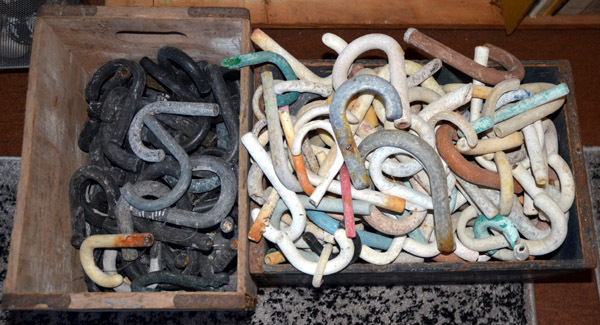 This collection came from a 480m long by 2m wide strip of Wainiha Beach. We even saw abundant plastic debris, including lids and ropes, in the water! Plastic caps have been found in the guts of dead seabirds on Midway Atoll. The grazers see brightly coloured caps at the sea surface and mistake them for food. Not just the oceans – Great Lakes plastic: More and more plastics are being found on lake and river surface waters, along riverbanks and shorelines, and in lake bottom sediments (4). Lakes Erie and Ontario are sinks for the greatest amount of plastics in the Great Lakes, mainly as a result of population density, plastics industries, and terminal location in the Great Lakes chain. So what to do with this scourge? Reducing the amount of plastic you use will help decrease the demand for production. In addition, stopping the release of plastic at its source will help keep our oceans and lakes clean. As anglers who spend as much of our free time as possible on the water, we can play a leading role here. Reduce, reuse and recycle. When that bag flies off the boat – turn around and get it. On the way out from that trout stream, pack up your trash and pick up a few pieces of someone else’s. When that largemouth splits your Senko or worm in half – put it in the trash, not in the water. Better yet, reuse it on a Ned rig. Put used and discarded line into recycling stations. Participate in river and roadside cleanups. Educate your friends and fellow anglers. Let’s do our part, it’s only our future we’re looking at here. 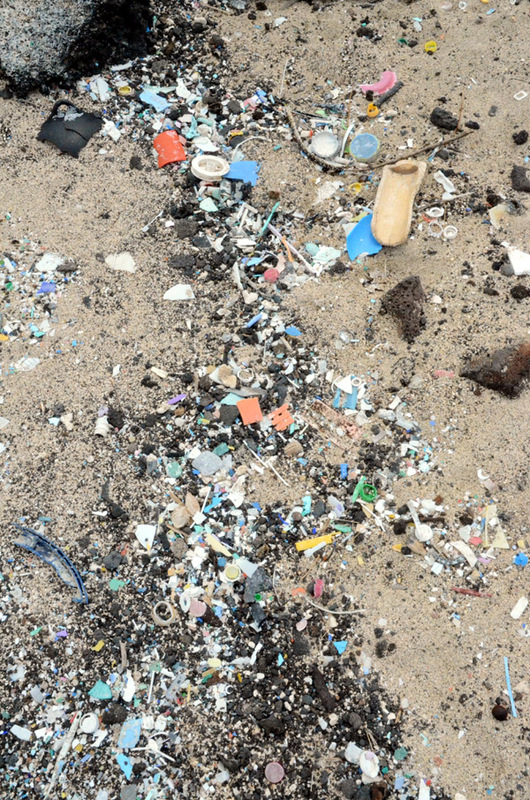 Plastic fragments, both large and small (microplastics), at the high water line (Wainiha Beach, Kauai, Hawaii). 1) P.L. Corcoran, M.C. Biesinger, M. Grifi, Plastics and Beaches: A Degrading Relationship, Marine Pollution Bulletin, 58(1) (2009) 80-84. 2) P.L. Corcoran, C. Moore, K.Jazvac, An anthropogenic marker horizon in the future rock record, GSA TODAY 24 (2014) 4-8. 3) M. Zbyszewski, P.L. 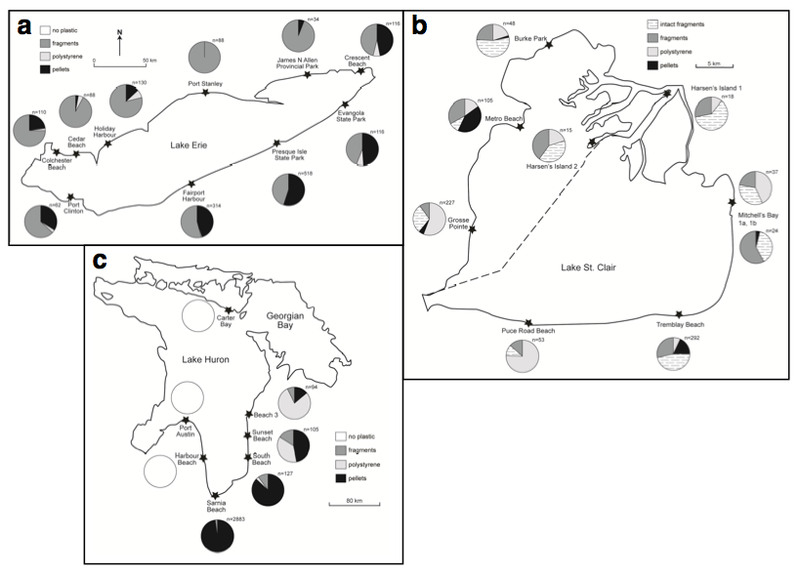 Corcoran, A. Hockin, Comparison of the distribution and degradation of plastic debris along shorelines of the Great Lakes, North America, Journal of Great Lakes Research, 40(2) (2014) 288-299. 4) P.L. Corcoran, T. Norris, T. Ceccanese, M.J. Walzak, P.A. Helm, C.H. Marvin, Environmental Pollution, 204 (2015) 17-25.